The Elementary Teacher Resume Template may be used as a guide when composing one of the most important documents one can generate. The sections contained provide an area to organize the information that a school’s recruiter must review when deciding whether a candidate will be selected for an in-person interview. In short, this is your on paper introduction to a hiring entity. 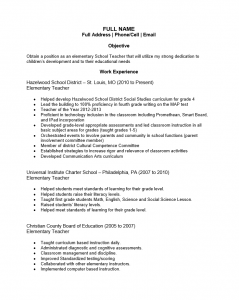 Typically, recruiters are faced with a multitude of inquiries for elementary teacher positions thus, it is important to have a concise resume. It should be to the point and demonstrate a certain proficiency in communication. Also, a candidate with more experience in other areas (i.e. a beginner) would be wise to attempt to relate his or her skills and/or experience to the job requirements. That is, job seekers should focus on aspects of their identity and history that can be carried over or applied to a position as an elementary teacher. Education hiring managers will have to go through quite a few resumes but will focus on candidates that can present their case through a resume well. 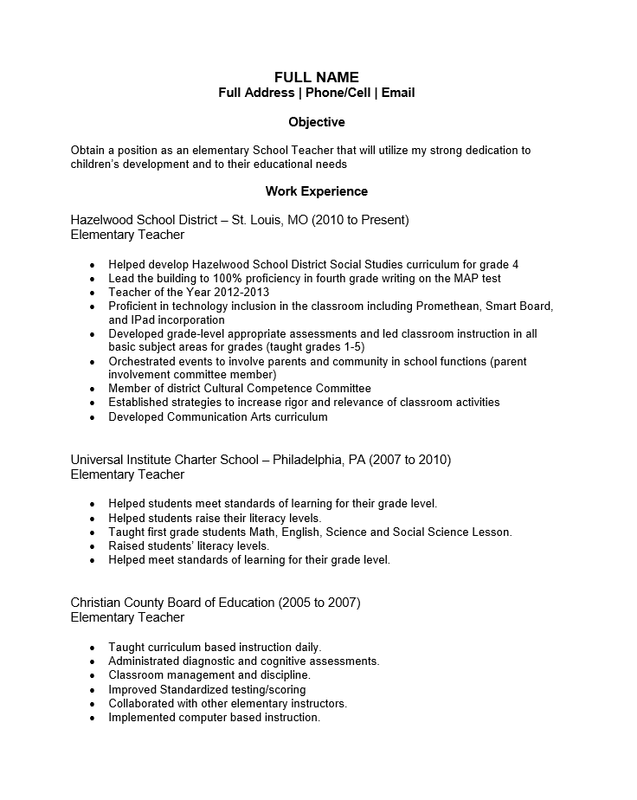 The Elementary Teacher Resume Template can be revised and updated for any reason at any time which makes it a time saver since some information on it will likely only need to change infrequently (i.e. home address). Thus it makes little sense to start from scratch every time one wishes to aim a resume at a particular position. While the purpose of a resume is to gain an interview, the purpose of a template is to make quick revisions when necessary. The elementary teacher resume template fulfills both of these purposes nicely. Step 1. Fill out the top center portion of the page with your name and contact information. Step 2. Under the heading named “Objective,” write a brief statement or two about your desire to obtain the position and the benefits you may bring the position. Step 3. In the “Work Experience” section, make a list of the places you worked and place them in descending chronological order. Each employer should have its name and location listed beside the date range in which you were employed. The next line should have your official title and the remainder of the entry should contain a list of your duties and/or achievements that you were responsible for. Step 4. Enter you’re your academic credentials under the heading “Education.” This should be composed of the official degree title, institution name, and location.